Joachim Blichfeld was not planning to spend another season in the Western Hockey League. So the 20-year-old forward from Frederikshaven, Denmark, didn't share the excitement that Portland Winterhawks fans and coaches expressed when the San Jose Sharks decided he could use one more season of junior hockey. "Obviously I wanted to stay there and play in the AHL. I was disappointed," Blichfeld says. "But now I'm back here and I'm excited about the season." Blichfeld was expecting to play for the San Jose Barracuda of the American Hockey League. His return will help Portland replace almost 300 points supplied last season by players who have moved on to the pros. Averaging almost a point per game in his first two seasons with Portland, Blichfeld has eight points (three goals, five assists) four games into this season. With the return of Cody Glass from the Vegas Knights last week, Blichfeld is on Portland's top line for the first time. In two games last weekend — including Portland's first win of the season in its home opener on Sept. 29 — Blichfeld had two goals and four assists, Glass had six assists and third line member Reece Newkirk had three goals and one assist. "You have to have a line that's a threat. And on the power play, they're a big-time threat, but just five-on-five they're a real dynamic threat," Winterhawks VP/GM/coach Mike Johnston says. "Every top team has to have at least one line that other teams are afraid of, and then you try to balance your team out from there." It is rare for 20-year-olds who have signed pro contracts to end up in the WHL. But San Jose has a crowd of forwards — including former Winterhawks Alex Schoenborn and Evan Weinger with the Barracuda — and decided another year of playing for Johnston was best for Blichfeld's growth. Blichfeld, a seventh-round NHL draft pick by the Sharks in 2016 who signed an entry-level contract with San Jose last December, says he felt great about this year's training camp with the Sharks. "But it's their decision, and I'm back here one more year to develop, and I will come back stronger (next year)," he says. Improving strength in his legs and upper body is the ingredient the Sharks want Blichfeld, listed at 6-1 and 188 pounds, to focus on this season. 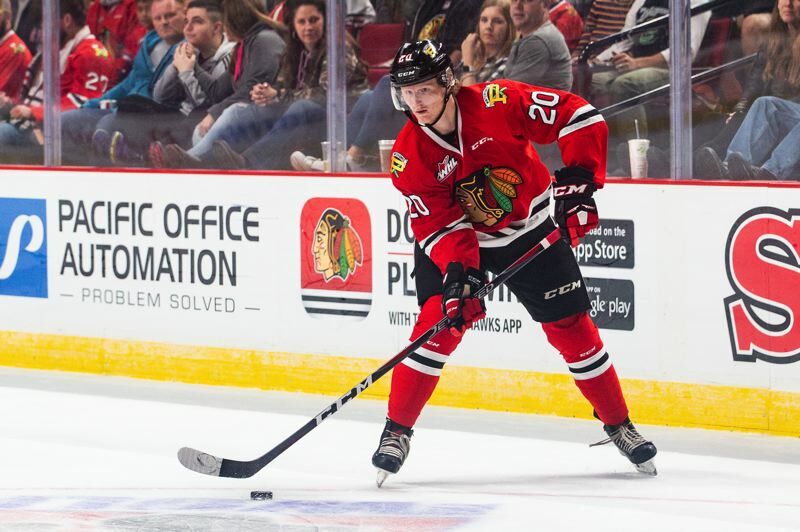 "They told me I'm a great player but I've got to work on my game and be a bit better physically," he says, "and that's what l'm working on down here with Richie (Winterhawks strength and conditioning coach/trainer Rich Campbell), so it should be good." In addition to scoring goals and developing physically, Blichfeld will be counted on as a leader on a team that has had significant roster turnover since season. Johnston has asked Blichfeld to share his experiences around the Sharks with the Hawks' young players, emphasizing habits such as eating right and putting in extra work on and off the ice to improve. "I just want to help the team win games, and obviously score some goals so we can win games. Be a great guy in the locker room and just have fun," Blichfeld says. It took Blichfeld "a couple of days" emotionally to come to terms with the delay to the start of his pro hockey career. He's back with a familiar billet family and some teammates he knows well. He is especially pleased to be playing alongside Glass. "Cody's the best player in the league, so it's really good for me to play with him. I'll get some confidence out of that," Blichfeld says. "He sees the game really good, so I should just be in the right spots and he will find me every time." n Rylan Bettens, a forward from Winnipeg, Manitoba, acquired from Brandon for a conditional 2021 WHL bantam draft pick, bolsters the Winterhawks' depth and, at 6-1, 195, provides some needed size. "He's an 18-year-old player who's just starting his career. He didn't get a lot of opportunity in Brandon, so he doesn't have a body of work in the Western League," Johnston says. "He's a bigger guy. He can skate. He's got some decent skills, so we thought he would add some depth." n The arrival of Bettens means someone who started the season with the Hawks will wind up elsewhere. As of Monday, 25 players were on the roster. The team will carry 23. Those decisions could be made before Ryan Hughes returns to the lineup — which could happen as soon as Portland's next home game on Oct. 10 against Edmonton. n A team captain had not been named as of Monday but was likely to be named by the end of this week — which began with a Wednesday game at Kamloops and includes a second game at Kamloops on Friday and a Saturday stop at Everett.